Not too internet-savvy? Email service@highheeledtraders.com with your address to order manually, we will provide the bank account and by the way, shipping is free! OR get it here paying via Paypal. You can also get it in Amazon.com and many online booksellers in Australia, UK, NZ and others worldwide. 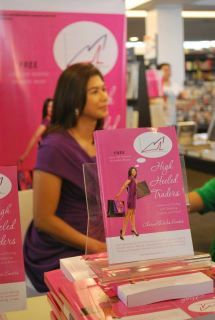 Also available in FullyBooked branches in Manila. In the book, I mentioned free materials and resources. Please click the links provided, and come back for new updates! “To Laugh Much …” — a post about my trading performance. Please register here to get video materials and other mobile site resources. FUNDRAISING NOTE : The book raises funds for United Nations Women as authorized by National Committee Australia, only when bought though other channels like Amazon, Barnes and Noble. We are unable to do so as yet through this website pending some formal documentation required by Paypal. Im pretty new in investing. I would like to ask if I can also have a copy of your e-book? Hi! I want to learn how you do it. Can I have your free ebook? I would really like to learn how to invest my money in the stock market. I hope you can also send me your free ebook. Thank you for sharing your expertise! God bless! hi Ms. Charmel, I just registered and am so excited to receive a copy of your ebook! I watched you at ANC’s On the Money, I am a working mom and very interested to learn the stock market and tricks of the trade. I hope I can also avail your free Ebook as you mentioned in the show. Thank you and more power! Thanks for posting! Sending the free eBook shortly. I hope I can have a complimentary copy of the book. I am very much interested to join stock market.